God continued His wonderful blessings in the month of June. We ported in Miami from “Cruise with a Cause” on Saturday, June 4th, which was my youngest Ellie Ann-Marie’s birthday. Shelly and I immediately boarded a plane and was headed to Nashville. Sunday, June 5th, I had the opportunity to speak to all the guests attending the Volunteers of American Charity Golf Tournament with a dear friend Randy Brothers. Then, on Monday, June 6th, we had a great time participating in the golf tournament. This event was a blessing and it was great to get to spend some time with so many great friends. On Sunday, June 12th , I spoke at First Missionary Baptist Church in Ozark, AL with Pastor Sham Jackson. It was a great service and I was honored to have some of my family there as well. Then on Monday, June 13th, I spoke at the revival at my home church Dothan Community Church with Pastor Charles Lewis. It was a powerful service and a blessing to be able to speak to my home church. On Thursday, June 16th, I headed back to Nashville to speak for a business leader breakfast for the Accelerant Organization. I was honored to meet so many great men and women from the area. God blessed me with a great weekend in Nashville with some great friends. I took part in a softball game and had many other fun times with my dear friend and former teammate Brian Burgdorf and his lovely wife Molly. May and June were busy months but God truly blessed me and allowed me to travel to some amazing places and meet some wonderful people. God is so Good! God had laid on my heart to take my entire family on a mission trip. I was able to connect with Dr. Matthew Dunnaway of Tuscaloosa, who heads up “Cruise with a Cause” to get this rolling. On May 28th, my family and I loaded a 15 passenger van and drove down to Miami for the cruise. We boarded the ship on Monday, May 30th, and was on our way to Montego Bay, Jamaica. This cruise was so powerful and the spirit on this boat was just amazing. The first night, we kicked things off by hearing Pastor John Hagee speak and his son Matthew Hagee sing. It was a powerful start to a powerful week. There was such an amazing lineup of speakers and artists, ranging from Bishop Paul Morton to Casting Crowns. I was even honored to be a speaker on this cruise. We ported in Montego Bay early Wednesday morning. I headed out with the men in my group and about 30 other men and women to Kingston, the Capital of Jamaica and also one of the most dangerous areas. We were going to speak with the men and women in the prisons, who are some of the most hardened criminals in Jamaica. After we arrived we faced some difficulty, but were finally able to get in. What we saw will forever change us. The conditions in these prisons are unimaginable. This is nothing like prisons here in America, where you have rec rooms, free time, three meals a day, and all supplies you need. While we were there, they were served a small bowl of something that we couldn’t even recognize. They are not even supplied with items for their basic needs. They have to buy them from the store, but most of them have no family who visits or sends money. Some of them said they just wish they could buy a toothbrush and toothpaste. It really makes you realize what we take for granted. I was able to speak to these men for a minute and then we split off and shared the gospel with them. There were several who gave their lives to Jesus and it was truly a blessing. We brought Bibles with us and they were begging for them. What a shame that here in America we have Bibles so freely lying around, but so many of us do not even take the time to read and study them. Wednesday night we had Jamaica Fest on the beach, where many of the speakers and artists performed for the people in Jamaica. We had thousands of school supplies that everyone had brought and we handed them out to the parents and kids. This event was very powerful. There were over 60,000 people there! It was unreal and the power of God fell on that beach, changing so many lives that night. On Thursday, we loaded a bus to visit the schools. My group was supposed to be going to an all girls high school, but after sitting outside the gate for about 45 minutes we were unable to get into the school. God had really spoke to me about how much we were needed in that school, but Satan was at work as well. So we decided to join the rest of our bus at Chetwood Memorial Primary School. As soon as we stepped off that bus, God just truly blessed. Those children had our hearts instantly. We split into separate classrooms and were able to share the gospel with these children. There were over 200 decisions that day! Before we left, we gathered into one classroom and those precious children started singing praises to Jesus with such passion. They were jumping up and down, waving their hands in the air, smiling, and singing at the tops of their lungs. They were just so happy to be praising Jesus. They were packed into a small dark classroom, they had no air, and it was so hot. They didn’t have the supplies that we have here. They played basketball with a bag filled with sand in a broken hoop, but they never once complained. They were so happy just to be there. I learned so much from those precious children and they stole my heart. We returned to the boat to board and depart back to Miami. It was bittersweet leaving Jamaica, but we will be back. We continued to be blessed by more amazing speakers and artists as we headed back to Miami. On Friday, we had our celebration service and found out there were 22,000 people saved during our time in Jamaica! PRAISE BE TO GOD! 22,000 people who gave their lives to Jesus. This Cruise was such an amazing experience and Dr. Matthew and all the people behind the scenes did an amazing job organizing this event. They are planning another one in 2013 and I highly encourage you to take part in this. You can find out more information by searching Cruise with a Cause on facebook and liking their page. God truly blessed my Ministry and allowed me to travel to some amazing places in the month of May. God is so good and He gave me the opportunity to do real Kingdom work for the Body of Christ. 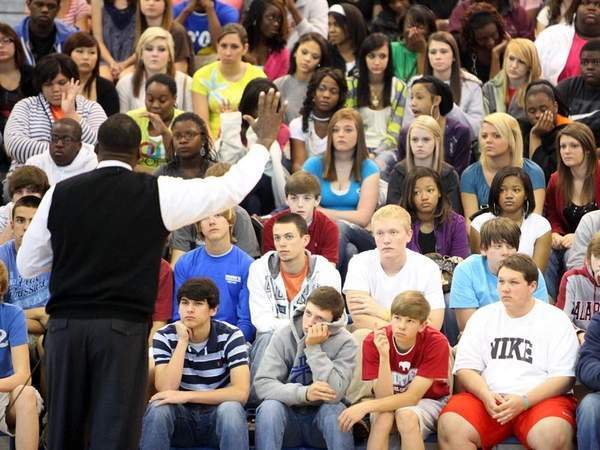 It began May 6th when I headed to West Limestone High School in Elkmont, AL to speak with their students. God truly moved and they were a great group of students. Then the next night, May 7th, I spoke at the Men’s Event at Salem Springs Baptist Church. This event was powerful, and the men in this community are such a great group. Sunday, May 8th, I spoke for the congregation at Pastor Kevin’s church of Salem Springs Baptist Church. God really moved in this service as well. Everyone in the community was so kind and welcoming, and I had a blessed three days there. I was honored to be able to speak at the Baccalaureate service at Ridgecrest Baptist Church on Sunday, May 15th. I love any opportunity that God gives me to speak with students about what God has for them if they align their actions with where they are going. Afterall, they are our future. Later that evening, I spoke at the evening service at Ridgecrest Baptist Church with Pastor Ray Jones. God moved in that service also and the entire day was just a blessing. Friday, May 20th, I headed to Camp Boothe in Green Pond, AL to speak to the men at the invitation of Dan Pierce. This is such a beautiful place and they are doing a great work at Camp Boothe. The next day, May 21st, I drove to Tuscaloosa for the Annual Gene Stallings Reunion. However, this year Coach decided to turn it into a work day for the community, which was affected by the April 27th tornado. We got there that morning and all had breakfast together before going out to the community of Holt to do cleanup. What we saw was unimaginable; every house in that community we were working in was destroyed. The amazing part of the story is that there is a beautiful church in the community within walking distance of the neighborhood. Even though there were so many houses destroyed, the church remained untouched. We split into groups and began cleaning housing lots. It was such hard work, but your heart couldn’t help but go out to these people as we were cleaning up what was left of their homes, their pictures, their memories…their lives. We all pulled together and had a very successful day helping those in need, but that was just a small part and so much is still needed to help all of those affected by these storms. April was a powerful month and I praise GOD for truly blessing my Ministry. It started off when I spoke to the wonderful volunteers who were part of the Bill Glass Prison Ministry on April 1st. I have had the pleasure of working with this ministry many times in the past, and if you ever have a chance to be a part of this ministry with either your time or donations, I highly recommend it. God has given me a heart for inmates and this is a wonderful opportunity to touch the lives of men and women who are probably at their lowest times. God’s blessings continued as I went out to speak at Tate Baptist Church in Corinth, MS on Monday April 4th with Pastor Mickey Trammel. What a powerful service we had and God really moved that night. April 8th and 9th I preached at a singles conference with Pastor Avery Henry in Snellville, GA, which is right outside of Atlanta. Both the Friday and Saturday services were awesome. God really moved in the lives of the singles who attended, and I was blessed during my time there. April 12th I was invited by another dear friend of mine, Coach Bill McDonald, to be the guest speaker at the 13th Annual West Alabama Leadership Prayer Breakfast in Tuscaloosa. We had a great turnout and this was a wonderful event that I had the honor to be asked to be a part of. After that, I traveled to Jackson, MS to Harmony Baptist Church where my close friend Pastor Ricky serves. The service was incredible and we saw God work in a mighty way. For Resurrection Sunday I drove down to Mobile, AL to speak at Knollwood Church with Pastor Aaron Fruh. Resurrection Sunday is such a powerful time and God moved Mightily in that service. I had many wonderful emails from the members of Knollwood in the days following, telling how God worked in their lives. It was wonderful! I then headed to Jackson, TN to speak with First Baptist Church of Jackson with Pastor Justin Wainscott. This is the home church of my dear friends Bill and Stacy Klein. We had a great time of fellowship and God truly blessed us all. On April 30th I was scheduled to speak in Gardendale, AL at Christway for their Heart of a Champion Men’s Event, but as you are all very aware, on April 27th a horrific tragedy hit our great state of Alabama. The tornados that hit all over our state were unimaginable and the widespread devastation was heartbreaking. That very night, I immediately headed from where I was speaking in Jackson, TN straight down to Tuscaloosa, AL. We were supposed to have a Charity Golf Tournament with Coach Stallings that very next day. I knew I had to get to Tuscaloosa…the place that was like home to me, the place where I dreamed of going when I was just a young kid, the place where my dream came true as I played for the University of Alabama, the place where I met my late wife Ellen Christina Bible. As I entered the city that was such a big part of my life, I couldn’t believe my eyes. I didn’t even recognize where I was most of the time; buildings just completely gone, homes just gone, people just lost. My daughter Shelly and I spent the next few days doing everything we could to help. We provided food for the people there and cleaned up some of the devastation. I’ve went back several times since then and just the magnitude of the damage and the time it will take to build the city back to where it was is hard to comprehend. There were so many other areas of Alabama that were destroyed as well. So many people have allowed God to use them to help their neighbor, to donate their time to clean up, to donate their money to provide needs, to donate their clothes and personal belongings to people who walked away with only the clothes on their back. It has blessed my heart so much to see how the people of Alabama and so many other states have come together to help those in need. April 27th will be a date none of us will soon forget. My prayers go out still today for the families who were affected by the loss of their loved ones, homes, churches, workplaces and so much more. Thank you for speaking to Pinson Valley High School. You have definitely made me realize a lot today, and really got to my heart. I hope everything is good with you. I am the deputy that met you at Pinson High School. I wanted to tell you that they had their prom last night and I truly believe your speech had an impact on these students, I know it did me. Thank you for the opportunity to hear you speak. I was at the event in Snellville, GA where you preached about The Meeting Place. The message was truly a blessing. I was fortunate to be able to sit in the front of the room on both days so I could hear and see how passionate you are about God and brining His word to His people. I was truly moved by your story and I am amazed by how you have stayed and kept your focus on God through all of your pain. Again, thank you for continuing to encourage people who have been or are going through hard times. I will keep you and your family in my prayers. I hope that you will visit Hope and Life Fellowship again and you are truly a blessing. Hello Mr. Stacy, this is Regina Lewis from Union Chapel and I really want to thank you for your powerful message today on, “The Power of Man” Thank God for using you to tell your testimony to glorify His Name!! My husband, Alphonso was really moved by your speech because he is a God fearing & a praying man!! We will never forget you or your message!! Also, we would like to take the time to give you a special thanks for taking the time to take pictures and for signing our Alabama caps!! My husband is a true Alabama fan which I guess you noticed with his Alabama tie!! He loves to mess with Ron Stallworth when it comes down to Alabama!! We will continue to pray for you, Shelly and your ministry!! God in Three Person, Bless in Trinity! Siran spoke to juniors and seniors at our public high school and brought a powerful message about choosing one’s direction in life. His transparency in sharing his own struggles and poor decisions and about the tragedy he endured spoke directly to the issues our students are facing today. We selected him as a speaker to discourage our students not to drink and drive, but he went above and beyond that message. I truly believe his message will impact our students for years to come. Siran is an anointed servant of God, and God is using him mightily. Praise be to Jesus for the month of March. It was a complete blessing and I thank you all so much for all of your prayers. The month started off on March 8th with a powerful visit to Athens, GA. Ron Coursen, Head Athletic Trainer, invited me up to share with the Georgia Football Team. My Brother in Christ, Keith Pace from Destin, FL was there with me and we witnessed the Power of God move young men’s hearts. I left Athens and traveled to Clinton, SC on March 9th for an FCA Prayer Breakfast at the Clinton Family YMCA. It was fruitful, there were high school students, college students, church leaders, homeless, juvenile delinquents all in attendance and all were blessed by the Word of God. After Clinton my next stop was Tuscaloosa, AL on March 10th at First Baptist Tuscaloosa Downtown for a Vision Awareness Dinner and Fundraiser along with Pastor Gill McKee, former strength coach Rich Wingo, Jack Rutledge and many friends along with a very good quartet singing. God really blessed us all. I ended the week that night down in Linden, AL at Linden Baptist Church for their Wild Game Dinner with Pastor Randy Creel. It was a great group of people and God really blessed the night. The next morning I was back in Tuscaloosa speaking at TCHS. Patsy Howell along with Sue Brewer headed this up, and with the principle consent I was able to come and speak with the students. It was the same format as PCS in Hattiesburg. This school was particularly special because Patsy had Coach Club Volleyball with my late wife Ellen. It was an emotional yet powerful event for all. Patsy have been sending me some very good feedback from the students. The next morning I traveled to Birmingham, AL and spoke at Mt. Canaan Full Gospel Church. It was such a powerful service. God Blessed us in a might way that morning. Their website is www.mcfgc.org and their church phone # is 205-929-0707 if or should you want to order a copy of the DVD which I highly recommend. I believe this message to be a mighty move of God. Pastor and co-Pastor, Willie and Patricia O’Neal were very receptive of me and their staff and elders were first class individuals. On March 29th my princess turned 8 years old! We had a birthday party down in Destin, FL with friends. And God blessed Shelly with a little Pomeranian puppy named Fuzzy. I am closing out the month on Thursday, March 31st doing a fundraiser for my good friend Clyde Goode who has been stricken with Lukemia. Alot of former Alabama football players will be out signing autographs and autioning memorabilia. This will be at Steel 1st and 23rd in Downtown Birmingham it starts at 4pm. Everyone is welcome to come out. My Ministry is continuing to grow, and I know I would not be able to continue to have the impact for God’s Kingdom without so many Saints of God praying for me and my family. Please be sure to check out my schedule and come visit if I am in the area, and also feel free to contact me through the booking tab if you have an event or church you would like for me to visit. Also, in closing be sure to check out the web banner on my page for Cruise with a Cause. You can click on this and it will take you directly to their web page. This is a Missions Cruise to Jamacia that I will be attending and speaking along with many other amazing speakers and artist. I would love for any of you that could to join me for this May 30th – June 4th, the rates are incredible and it is a wonderful opportunity to be a part of a Mighty work of God in the lives of the men, women and children of Jamacia. Thank you again and I look foward to coming to a city near you. Hello everyone! Here are a few pics from recent speakings. I hope everyone has been enjoying our time together as much as I have! OXFORD, Ala. (AP) — Siran Stacy struggled with depression, anger and his own shaken religious faith after his wife and four of his children were killed in a car accident. Now, the former Alabama running back is urging others to keep the faith whatever the circumstances. Stacy, 39, was driving his family home from his mother’s house when a drunk driver crossed an intersection and struck his car on Nov. 19, 2007 near Dothan. The accident also killed 29-year-old Adam Wayman, the other car’s driver. Stacy and his 3-year-old daughter, Shelly, were seriously injured in the crash. Out of great pressure and tragedy God has fashioned a unique man with a unique message. Your message was from the heart, timely and gave each member of the ACIPCO family something to reflect upon. Thank you so much for reminding us of those things that are important in life and how we can help make a difference in our community. Your talking points were inspirational, motivating, and encouraging to do the right thing and never give up!